“I say it’s crackle the crispy sound. When my mom made Rice Krispies Treats for the very first time, I remember thinking that there couldn’t possibly be a better snack on the planet. Through the years, Kellogg’s has put out hundreds of recipes using Rice Krispies, but it’s hard to beat the iconic sweet cereal-and-marshmallow square. 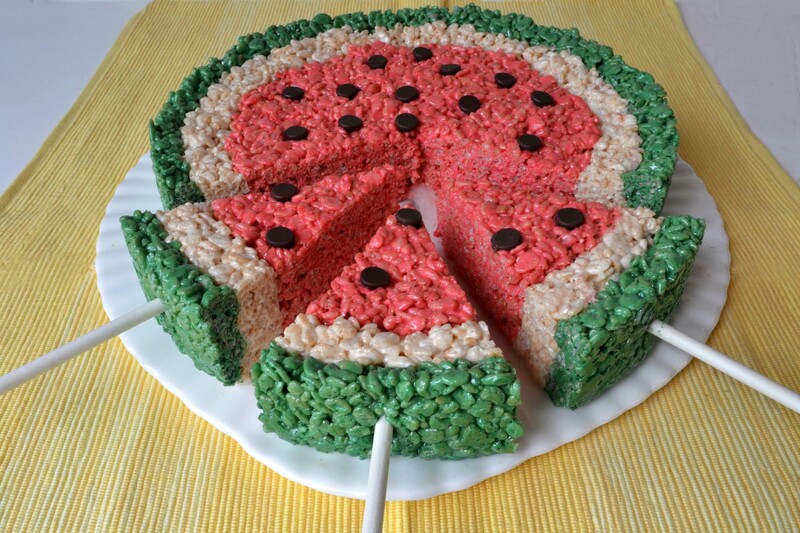 Well, let me share with you and “the boys” a very fun twist on the treat just in time for summer! It’s a giant Kellogg’s Rice Krispies Treat in the shape and color of a watermelon. It’s simple. It’s fun. In fact, you can make it in a snap! “Snap, what a happy sound. Snap is the happiest sound I’ve found. But Snap… makes the world go ’round. Spray a 9" spring form or baking pan with baking spray, or grease with butter. In a microwave-safe bowl, melt the mini marshmallows and butter until puffy (about 1 minute). Immediately add cereal and a few drops of food coloring. Mix with a buttered spatula or spoon. With your fingers, line the pan with the green cereal so that it is about ½" wide and ¾ of the way up the pan. In a microwave-safe bowl, melt the marshmallows and butter until puffy. Add cereal and mix with a buttered spatula. Press it up next to the green cereal, creating another ring a little wider than the green rind. Fill ¾ of the way up the pan. In a larger bowl, melt the mini marshmallows and butter. Add the cereal and red food coloring to desired color. Press the cereal into the center of the pan and, with your hands, press down to pack all three colors together. Place the chocolate chips, flat side up, randomly in the red fruit part of the watermelon. Let harden. Cut into wedges. For wedges on a stick, insert a stick into the wedge while the cereal mixture is still soft.